Rajeeb Hazra is corporate vice president of the Data Center Group and general manager for the Enterprise and Government Group at Intel Corporation. He is responsible for leading Intel’s Enterprise IT and Technical Computing solutions into the data center for our Enterprise & Government customer segments. 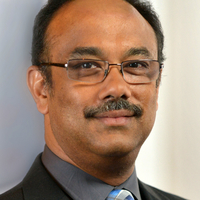 During his career at Intel Hazra held the positions of director of Supercomputing Architecture, director of the Systems Technology Lab in Intel Labs (then called the Corporate Technology Lab) and technical assistant to Intel's chief technology officer. He joined Intel in 1994 as a software engineer in Intel Architecture Labs, working on video compression/decompression technologies. Before coming to Intel, Hazra was with the Lockheed Engineering and Sciences Company based at NASA's Langley Research Center. Hazra earned his bachelor's degree in computer science and engineering from Jadavpur University, India. He also holds a master's degree in computer science and a Ph.D. in computer science, both from The College of William & Mary.